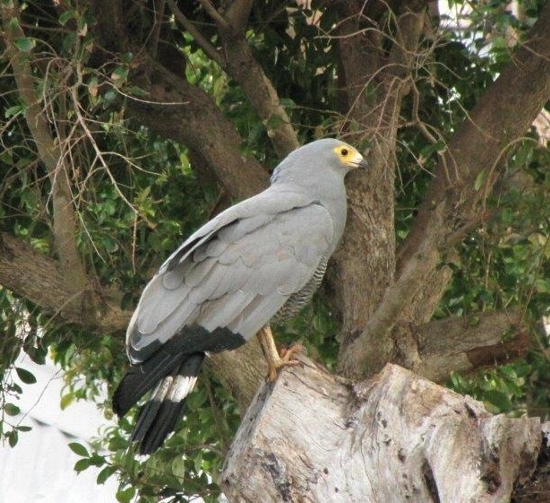 Simon Fogarty photographed this African Harrier-Hawk in his garden in Frogmore Estate. image from the City of Cape Town website. Cape Town dam levels published on 25 July 2016. 18 degrees 27' 30" E - 18 degrees 29' 00"E.
It is 25 kms south of Cape Town, on the South Peninsula. The mouth of Zandvlei opens into False Bay, at Muizenberg. The catchment of Zandvlei extends furthest north to the source of the Diep River above the Kirstenbosch Botanical Gardens about 15kms away and then enters Zandvlei as the Sand River in the north east. Streams from the Penninsula Mountains feed the Keysers and the Westlake Rivers which flow into Zandvlei from the north west. The main waterbody is about 96 hectares. The average total annual rainfall is between 450 - 700mm. Zandvlei is rated in the top 25% in importance of all the estuaries along the South Africa coastline. It is 43 out of the total of 256. At mid summer the sun angle is 79 degrees above the north horizon and mid winter it is 33 degrees. Day time air temperatures can range from 40 to 5 C degrees in mid summer to mid winter. Mean seasonal average day temparature is 22 C degrees. Air temparature and wind strength does vary and is influenced by local geographical conditions. Humidity levels are low, due mainly to the prevailling cool winds from the sea, in the south east, south west and from the north west directions. 3. Information Management updated 15/08/2016. Salinity updated Note Zandvlei Estuary mouth opening and closing dates are under Salinity. Invasive terrestrial plant clearing updated 14/08/2016. Download - River Health, Community Water Monitoring Toolkit. The Mini SASS toolkit by GroundTruth. Send your contributions, comments or queries to Gavin Lawson.